The presidential candidates in the election race are required to obtain more than 50 percent of the votes. 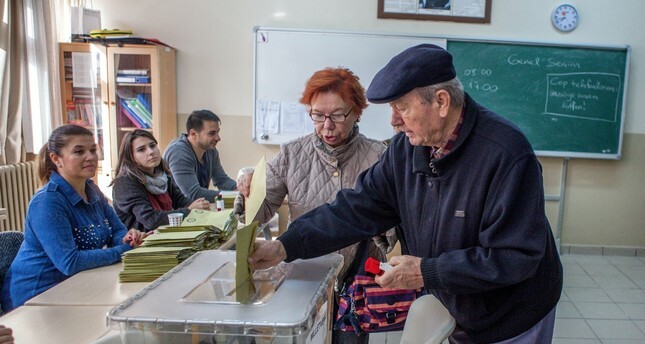 Recent surveys on the presidential election indicated no certainty on whether it will end in the first round or not, even though they all point to President Recep Tayyip Erdoğan leading the race. As time draws near for the presidential election scheduled for June 24, research companies have been announcing their predictions based on surveys pointing to different scenarios regarding the election's results. According to a latest survey by ORC Research Center, Erdoğan is likely to obtain 53.4 percent of the votes in the first round of the elections. The survey was conducted between May 28 and June 1 in 37 provinces of Turkey with the participation of 3,410 people. The candidates are required to obtain 51 percent of the votes to become president. Erdoğan was followed by the Republican People's Party (CHP) presidential candidate, Muharrem İnce with 24 percent of the votes. According to ORC estimates the Good Party's (İP) Meral Akşener would receive 11.5 percent, the pro-PKK People's Democratic Party's (HDP) Selahattin Demirtaş would get 8 percent and the Felicity Party's (SP) Temel Karamollaoğu would receive 2.1 percent of the votes. Another survey conducted by Remres Research pointed out that Erdoğan may receive the highest percentage of support but there might be a second round of the elections.According to the survey, the estimations for the first round left Erdoğan with 42.2 percent, İnce 24.6 percent, Akşener 16.9 percent, Demirtaş 12.3 percent, Karamollaoğlu 3.8 percent and Patriotic Party (VP) candidate Doğu Perinçek with 0.2 percent of the votes. On the other hand, A&G Research Company General Manager Adil Gür previously announced that 55-60 percent of the voters would support Erdoğan in the presidential election, stressing that there will not be a second round of polls. Erdoğan will run in the presidential elections as the candidate of the People's Alliance which was formed by the ruling Justice and Development Party (AK Party) and the Nationalist Movement Party (MHP). The main opposition CHP announced İnce as its candidate after a long search. Earlier, it was expected that the opposition parties would field a joint candidate. However, their efforts failed and each party announced their own candidates. İnce, who is an intra-party rival to Chairman Kemal Kılıçdaroğlu, became CHP's presidential candidate. İP Chairwoman Akşener became her party's candidate by collecting 500,000 signatures and Karamollaoğlu became the SP's candidate. The polls have not indicated with certainty who will come in second in the elections. Remres Research has claimed that if CHP's İnce faces Erdoğan in the second round, he may receive 41.9 percent of the votes; while Erdoğan is expected to get 42.2 percent. The predictions tallied without factoring in the distribution of swing voters. However, when the swing votes are distributed, Erdoğan comes as the victor in the second round, with 51.52 percent. According to the election survey conducted by Gezici Research, Erdoğan will receive 46 percent of the votes, and Akşener will come in second with 25-27 percent, gaining more votes than CHP'S İnce. In a recent statement last week, Akşener, who is part of an alliance with İnce, claimed that if the CHP's candidate faces Erdoğan, he will not be able to win. The Nation Alliance, formed between the CHP, the İP, the SP and the Democrat Party (DP), is limited to the parliamentary elections, with member parties nominating their own presidential candidates. İnce has also said if Akşener enters as the second runner, then he would support her in exchange for a vice president position.